While a TFSA can be used for any type of savings, an RRSP is used exclusively for retirement savings. TFSA contributions aren’t tax deductible whereas RRSP contributions are i.e. with an RRSP, you can deduct the contributions that you make from your income when you file your tax return. 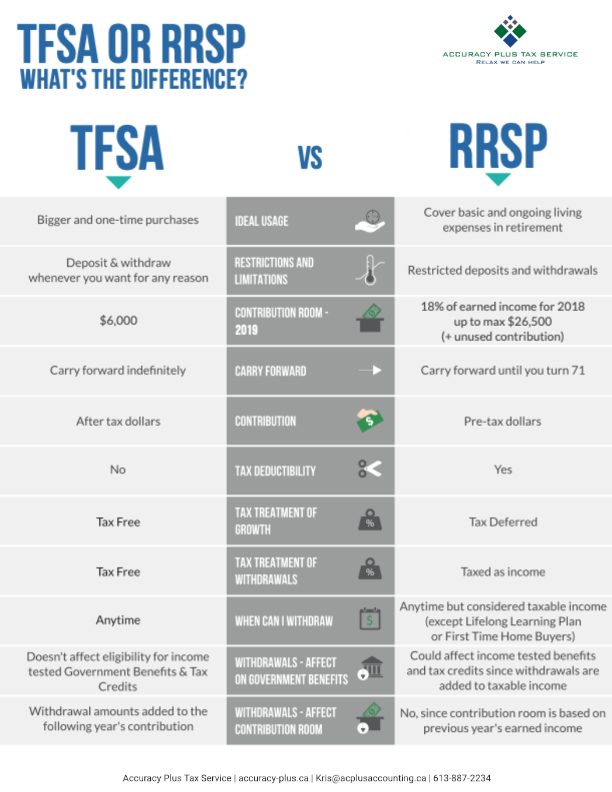 It is required that you use earned income to contribute towards your RRSP but this is not the case for your TFSA. You can continue to contribute towards your TFSA for as long as you like, whereas you must close your RRSP and stop contributing towards it when you turn 71 and purchase an annuity or convert it to a RRIF with the savings that you have made within the plan. You are able to specify your spouse as your beneficiary with both your TFSA and your RRSP, however there is a key difference with how your savings are treated upon your spouse’s death. With an RRSP, there will be taxes payable upon the monies left in the plan by your children who inherit it, whereas with a TFSA, tax is only paid on the increase in the value of the plan since the date of death in the year that it is inherited by your children. What’s more, no tax is payable if the value that they receive is less than the value of the TFSA at the time of death. In summary, your individual circumstances will dictate which plan is the most appropriate for you, depending on your tax position and withdrawal intentions. The primary difference between both plans is the timing of the taxes payable i.e. if you want to defer the payment of your taxes, particularly if your marginal tax rate will be lower in retirement, an RRSP may be more beneficial for you. Alternatively, if your marginal tax rate will be higher when you plan to make withdrawals, a TFSA may suit you better.